What does the sea smell like? Here’s a question I’ve never asked myself before. But when I was trying to pick out the right essential oil for this bath bomb recipe, it all of a sudden became a mind-boggling dilemma. A little salty maybe? With a touch of fresh air and a whiff of sun tanning lotion? Here’s a little side anecdote: imagine me trying to recreate that pondering moment as I’m writing this post on the train: eyes closed, nostrils wide open, taking in a deep breath … and regretting it the same moment. This train DOES NOT smell of the sea. 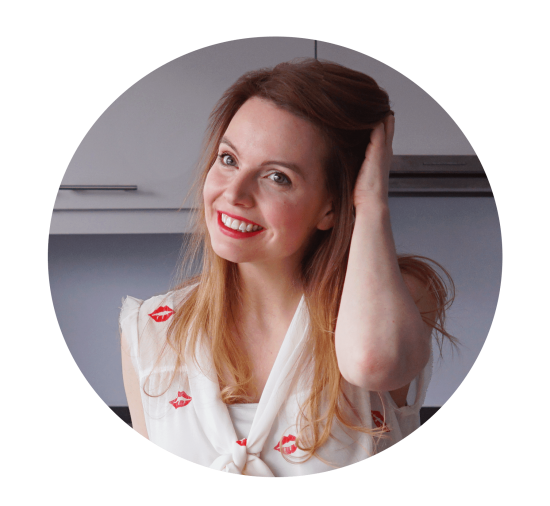 I love the scent of ylang ylang and I’ve used it in many of my bath bomb recipes, like my matcha bath bombs and surprise rainbow bath bombs. The idea for these ocean bath bombs actually started with the dip. 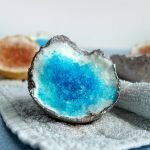 I’ve been wanting to make bath bombs that are coated with a bath melt mixture for the longest time. 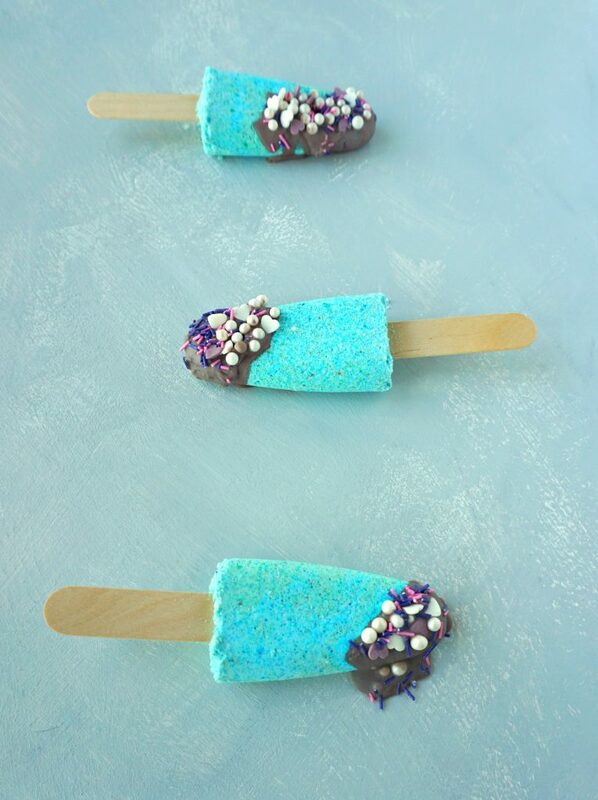 I got inspired by all of the dipped ice cream popsicles on Pinterest and decided to recreate them with my own bath bomb version. 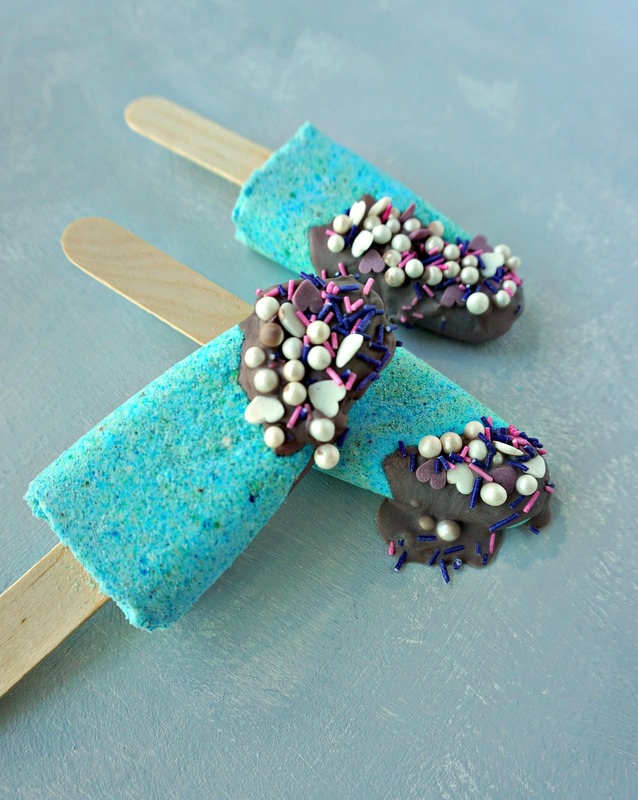 For this recipe I used regular popsicle molds and wooden craft sticks. And that worked remarkably well! I chose a mermaid theme for the colors since everyone (OK, just me then) is OBSESSING over mermaids lately. Combine 1/2 cup of baking soda, 1/4 cup of citric acid and 1/4 cup of corn starch in a bowl. Mix well with a spoon. Carefully add 1/2 to 1 tablespoon of rubbing alcohol to the dry ingredients. Stir well to combine. You can use a spoon or whisk. I use this tiny whisk that is perfect for all of my bath bomb crafts! As you’re adding the rubbing alcohol, check the mixture regularly by taking a handful in the palm of your hand and squeezing it together. The mixture should clump together. At this point you can also add a few drops of essential oil to give your bath fizzies a nice scent. I added about 6 drops of ylang ylang essential oil. Scoop half of the mixture out of the bowl into another bowl. 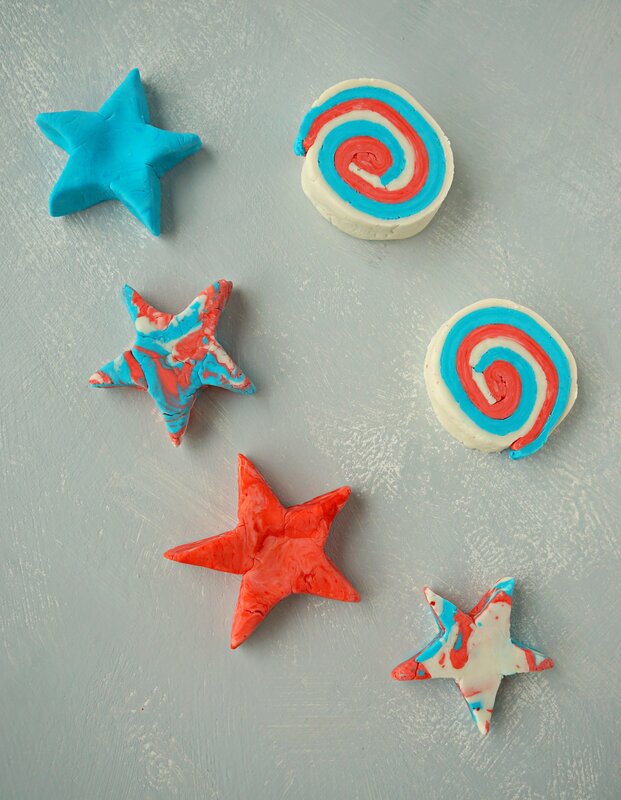 Add a drop of different coloring to each batch. I used green and blue. You can also just use 1 color or create more batches and use more colors. Before filling the molds I combined both colors together in a bowl and gave it a quick whisk. You can also layer the colors because the difference in color did show up as much as I wanted in mine. It did unexpectedly create this pretty turquoise color! To shape my bath bombs I used a basic ice cream popsicle mold. I filled up the molds and then stuck a wooden craft stick in the middle. Next I pressed the mixture down firmly to make sure the sticks couldn’t move anymore. I let the bath bombs dry in their molds. Once they are hard you can carefully take them out of their molds. To make the bath melt dip, melt 2 tablespoons of cocoa butter in a microwave or using the double boiler method. Once the cocoa butter has completely melted you have to let it harden again. Sounds a bit strange, but the cocoa butter actually needs to be the right consistency. Thick, but a little runny at the same time. A little bit like pudding. To give the bath melt mixture some color I added a pinch of silver edible glitter dust to the mixture. Gold or a different color would work too. You can find this at the baking aisle of a supermarket or you can buy edible glitter online. Once the cocoa butter had the right consistency I placed the bath bomb popsicles on a piece of baking paper. Now that the bath melt mixture is still sticky I added some sprinkles on top. As the mixture cools down the dip will set. Now all that’s left for you to do is enjoy your bath bomb! These are so cute! I totally thought they were popsicles at first glance!